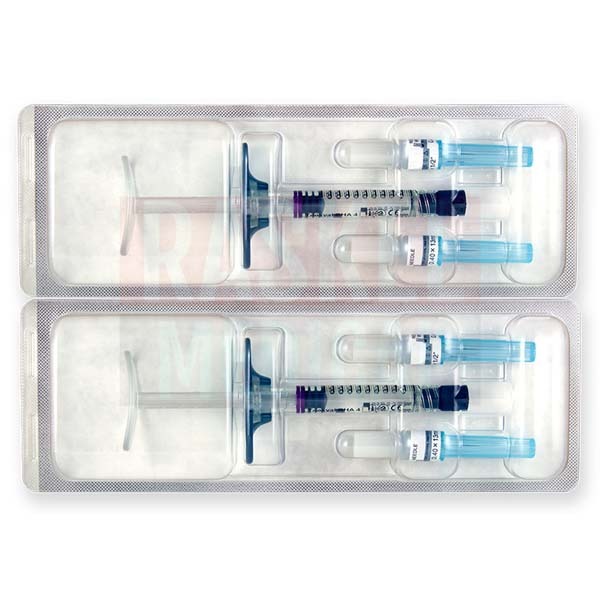 Teosyal RHA4 is a sterile, injectable implant made of cross-linked hyaluronic acid and lidocaine, a built-in numbing agent. This dermal filler is intended to fill in deep wrinkles, enhance facial volume, augment facial features, and reduce the appearance of scars and various other skin depressions. When used on textured skin, the dermal surface will instantly appear more radiant with less visible wrinkling and imperfections. When injected correctly, the hyaluronic acid of this product adapts to and does not interfere with the natural muscle movements of the face. This will prevent early absorption and help ensure long-lasting results. Only licensed practitioners can utilize this filler. This injectable adds hyaluronic volume to places of the skin that need it most, be it the cheeks, cheekbones, or the other features and contours of the face. When adding moisture to these areas through hyaluronic acid’s moisture-binding properties, wrinkles will be cleared away and the appearance of dermal depressions will be reduced. You may also use this filler to correct minor ptosis and assist with treatment of problems around the lower eyelids. Teoxane Laboratories creates the entire Teosyal skin line, including this product. This product and the company that manufactures it originates from Europe. When can Teosyal RHA4 cause side effects? Typical and harmless side effects related to this filler include erythema (redness), swelling, and general discomfort near and around the correction area. Since these side effects are relatively short-lived, you can expect them to clear within a few days from the initial procedure. Other side effects, precautions, and contraindications to be aware of are available in the package insert. 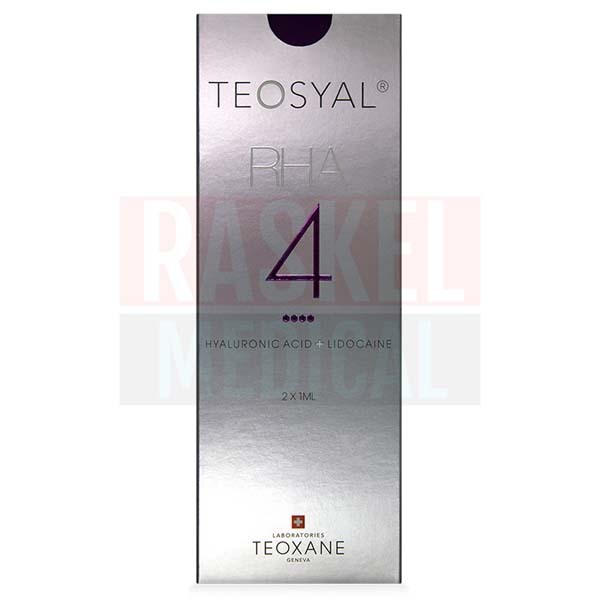 Which skin type is Teosyal RHA4 good for? 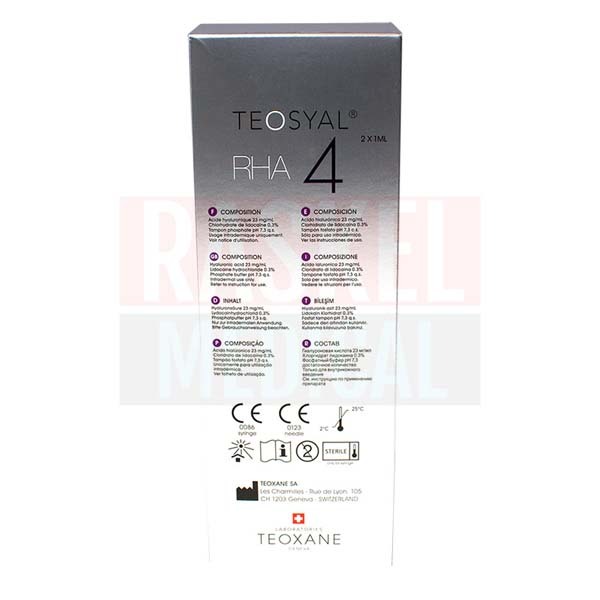 You will see a tremendous difference when using Teosyal RHA4 on mature, sensitive, and thick skin. This is because this filler is used to treat very deep wrinkles to create a softer, less texturized appearance while adding volume for an overall youthful look. Plus, injection-related pain and/or discomfort will be significantly reduced with the presence of lidocaine, which ultimately makes this product better-suited for skin types with a lower pain tolerance and significantly thicker skin than most. What is Teosyal RHA4 made without? The hyaluronic acid is of non-animal original. This filler for the face is also free of latex and synthetic ingredients. All the tubes and containers that come with a box of this product are sterilized before packaging. Be sure to dispose immediately after use as both are single-use only. What is the difference between Teosyal RHA4 and Teosyal RHA3? 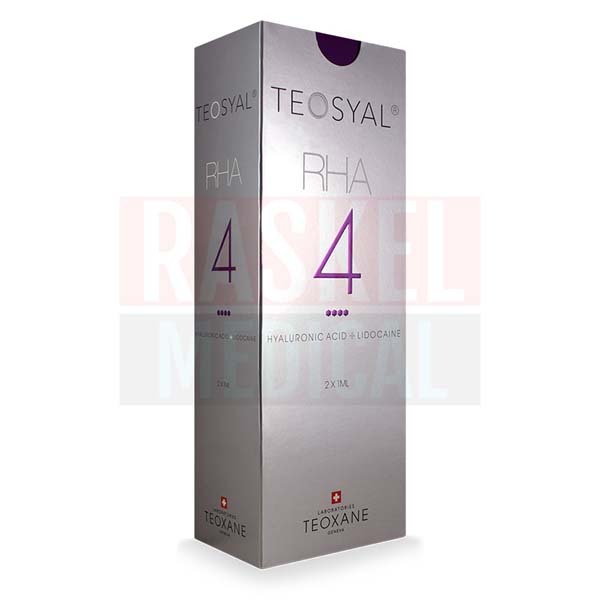 Teosyal RHA4 is for correcting deep wrinkles and depressions while improving the look of scars and adding volume to shapeless areas on thicker skin types. Teosyal RHA3 is simply for filling deep wrinkles. Disinfect the surface area(s) to be treated before injecting the filler. A topical anesthetic is not required; however ask, your patient of his or her preference. Slowly inject the needle into the subcutaneous fat tissue using the amount of volume needed to fulfill the desired results. Stop injecting before removing the needle to prevent the solution from pouring out of the treatment area. Massage the injection site to evenly distribute the filler. Safely dispose of your materials. Review the package insert for more instructions on how to administer this filler. The active ingredients that give this dermal injectable its powerful abilities include cross-linked 23mg of hyaluronic acid, 3mg of lidocaine hydrochloride, and 1ml of phosphate butter pH 7.3. This skin filler can last within the skin for six to nine months. Usually patients will require touchups when results begin to fade. At this point, patients will need to return to your clinic for maintenance; they will need to do this around two to three times a year if they want to maintain the results of this filler. Without overcorrecting or injecting the needle too superficially, results should be natural-looking and in proportion to the rest of the face. When you store your dermal fillers correctly, they tend to live up to expected their shelf life and perform as indicated. For this injectable for the face, it is best to keep the package away from sunlight to avoid affecting the filler in any way. You must also keep the temperature between 2°–25°C. This filler can last between 18–24 months in storage. Do not administer the filler once it has expired; It’s important to conduct regular inventory checks for this reason. Start saving on injectables when you visit RaskelMedical.com, your go-to online source for cosmetic and medical fillers and so much more! We offer a wide variety of skin products at the lowest prices on the market. If you happen to find a lower price elsewhere, just let us know, and we will gladly price match because your satisfaction is our guarantee! To learn more about our price matching policy and other great ways to save while you shop, such as our shipping and referral programs, simply call us today, or leave us a note on our website.